Summit lecterns are the perfect lectern particulary if the lectern is for portable use, especialy if it is ever used outside. It is made of a one piece durable shell of polyethelene. The podium shell is available in different colors to match the decore or look you want. It comes in three different styles, the Da Vinci at 30 inches wide for the formal look, the Classic at 25 inches wide for the standard every day lectern, and the Traveler at 22 inches for ultra portability and a sleek look. There are stock inserts or you can have the inserts made of any of the thousands of plastic laminate designs or use metal, plastic, wood, posters, cloth to create your own unique design. Check out our gallery of lecterns to see some of the options. Custom logos are also available. At 43 pounds with tilt back wheels they are easy and safe to lift. Avoiding risk of damage to the facility or personnel. The podiums are water proof so you can use them anywhere. 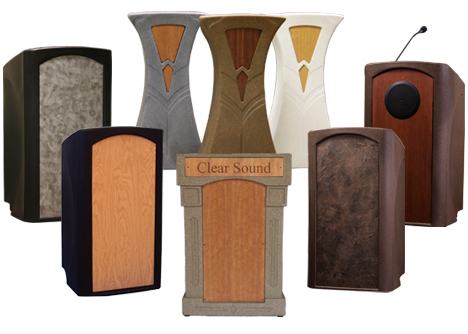 Summit lecterns offers only the best state of the art electronics with their lecterns including Clear Sound Corp's "Intelligibility" microphones, mixers, amplifiers and speakers. Built in computers are available and all cables are professional ASG durable cables. With a 12 year warranty all of this make the Summit Lectern the most cost effective lectern in the world.